You don't have to be crackers to work here, but it probably helps. 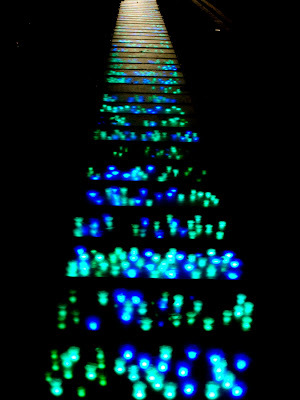 The pavement lights under London Bridge (two days ago) reminded me of another place with lights in the floor. This is the Trade Union Congress building in Great Russell Street. 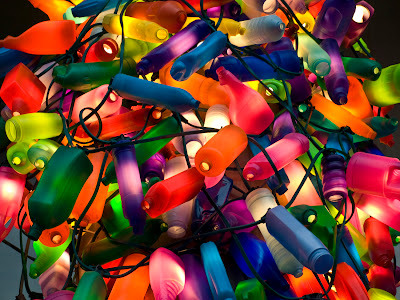 I just liked this shot a lot more that the one that showed the coloured lights. 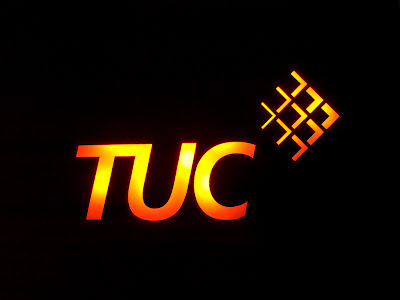 For people wondering, "Tuc" is a brand of cracker. What can I have been thinking of? It's been two months without an elephant - I apologise. 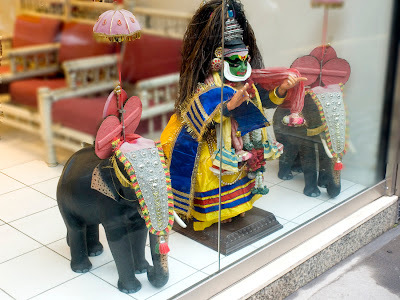 So here we have two, in the window of the Indian Tourist Office in Cork Street - which fits in nicely with the location for The Way We See It this week. Just DON'T ask me what the character in the middle is doing. The elephant series is here. If you've never seen this before, you may have trouble identifying this. In the pavement under the south side of London Bridge, for some unknown reason this lights are set into the pavement and constantly change, making new patterns all the time. You can see a general view of the scene here. If you found yourself in St Botolph's Churchyard by Liverpool Street Station (not on the map) you might be forgiven for thinking that the Moorish building containing a restaurant was a modern marketing gimmick, for the restaurant it houses. It certainly qualifies as one of London's oddest buildings. However, your suspicions might be aroused by the quality of workmanship of the tiles, stone and stained glass, rarely found these days. 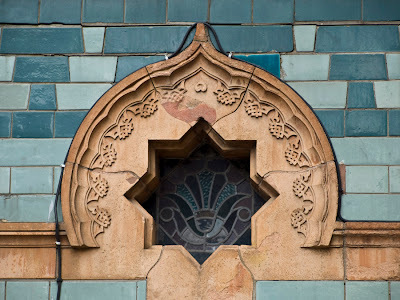 It is actually the entrance to what was a Victorian Turkish Baths, you can read their history here. A more general view of the building is here. If you are in the vicinity, I'd recommend seeking it out, it always makes me smile. 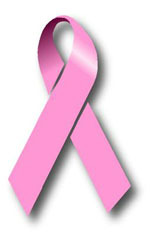 "HMD aims to commemorate, to educate and to prompt action in the UK. HMD commemorates the lives of those lost in the Holocaust; as a result of Nazi persecution and in more recent genocides. It educates about the Holocaust and it lessons for the present day. It prompts action in the UK highlighting the continuing dangers of racism, anti-semitism and all forms of discrimination. The tragedies of Cambodia, Bosnia, Rwanda and Darfur show that the international community, and each of us as citizens, has not truly understood the lessons of the Holocaust." The photo is of an installation called 6 million + buttons and is an attempt to try to let your mind get round the concept of what six million means. Me? I always used to imagine that one morning, London was empty. All the streets, all the houses, all the shops. If you get the chance do go and see this and contemplate. 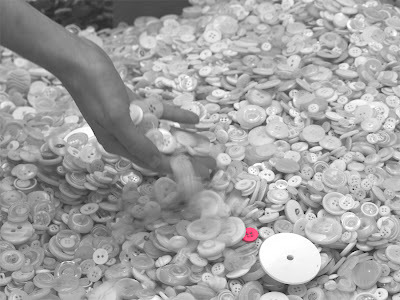 Take some buttons with you, too. A more general view here. 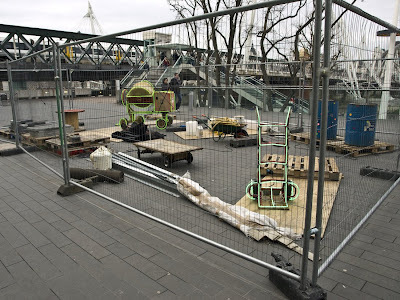 This photo is a again part of the South Bank festive lights and I was wondering whether to post it, but then I thought it is such fun, because it looks exactly like a building site. That is, until you see the neon round the cement mixer and odd lights everywhere. Both yesterday's and today's are there till the end of January only. There are always art installations around the South Bank, and this one caught my eye. It's part of the Festive Lights display, made out of recycled bottles. The simplicity and elegance of 1930's building has stood the test of time. 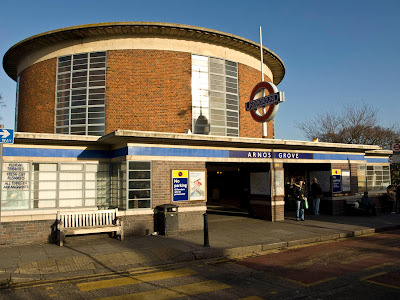 Arnos Grove tube station is one such and one of the few remaining. Fortunately, all remaining ones are listed buildings now. Wikipedia has the history and background. 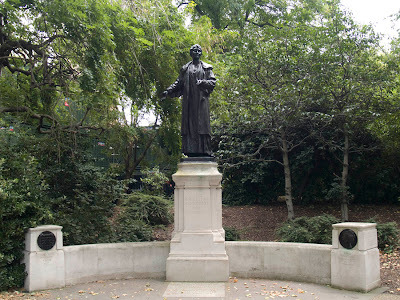 See where on the London Daily Photo Map. This post started with yesterday's photo, because I noticed one of the sponsors names on the helicopter was Preston Motors. I knew them because they are a Skoda dealer in Forest Gate, To say they are less glossy than most car dealers fails to convey what Forest Gate is like. 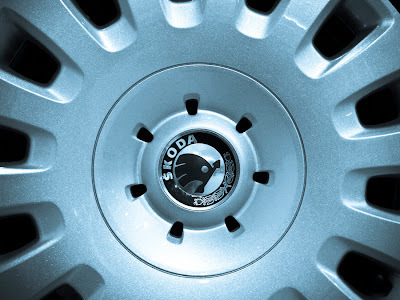 They've been around for years, too, since before VW days, when the name Skoda was a joke (How do you double the value of a Skoda? Fill the petrol tank). These post VW days, things are more shiny, but still, this is a small, east end, family business and no BMW showroom, believe me. I wanted to find out what the story was. Turns out that they sponsor the response cars which are used by the HEMS Trauma Service at night when the helicopter can't fly. Simple as that. Gives you a warm feeling. 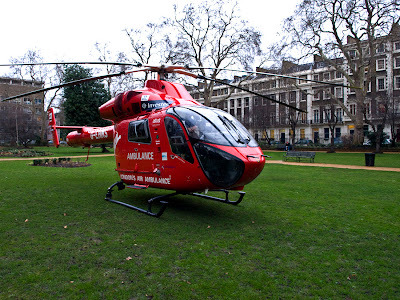 The London Air Ambulance (HEMS) is unique in this country in that they bring the hospital to the patient. You can read more about it in this excellent article. They have a blog here. I was riding riding back home when I saw the helicopter had landed in Gordon Square. Talking to them I found out that they were there becuase of an accident in Euston Station (hope whoever is OK), that the helicopter had four blades so that the blade span could be shorter and that the two things that look like guns in the front were actually airspeed indicators. Who put the Bishop into Bishopsgate? Kitty reminded me a couple of days ago that I hadn't shown you this. 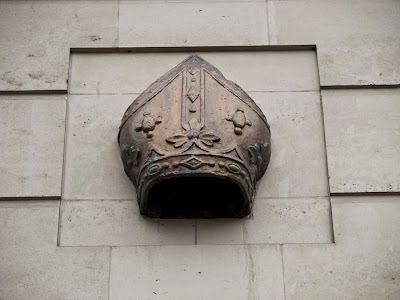 This Bishops mitre marks the spot where the original city gate stood, look up on the wall to see it. The gate dates back to Roman times, and was used - like London Bridge - to tastefully display the heads of executed criminals. This may not look it, but it is quite an exciting weekend. That is because for the first time in 400 years, the Middle Temple is opening up to the public. 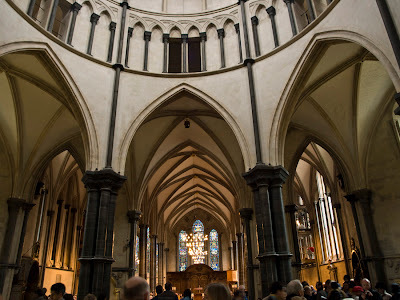 Not only can you see the Middle Temple church as here (the church of the Knights Templar, featured in the DaVinci Code) but you can see the very special Middle Temple Hall. I'm fairly certain you'll be able to read more about that here (crisp deficiencies notwithstanding). Open Day continues Sunday, so get down if you can. and will we be in Paris soon? 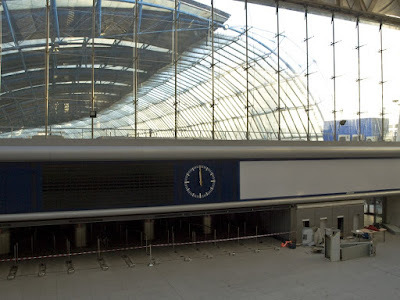 Turn around from yesterday's shot and you will be confronted by the abandoned Eurostar terminal. Not long ago this was your gateway to Europe, no matter when you looked, you found a hive of industry. Now it lies sad and empty. What's going to happen to it? It's going to be used for ordinary trains. It's very rare that pigeon protection adds anything to a scene, but the wild hair made me smile. 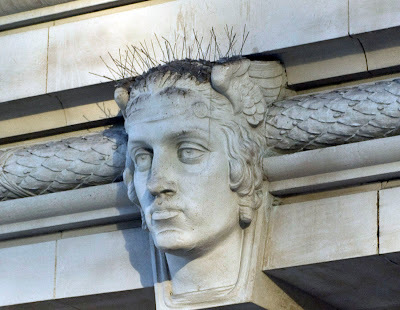 You can find this in the detail above the door to Eurostar House in Waterloo Station. It depicts Hermes, the Olympian god of boundaries and of the travellers who cross them. He is the god of thieves and liars, too, which I think is tremendously appropriate for those people who draw up train timetables. It was two years ago that I last showed you Alison Lapper on the fourth plinth , the choice of the 2008 selection is in the news and I haven't shown you what's been on it in 2007. I'll fix that now. 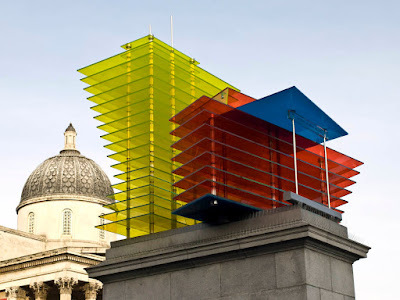 This is Thomas Schutte's "Model for a Hotel 2007", a translucent sculpture designed as a hotel for those who visit the square. It's designed to change with the conditions and the light, so I went around the other side and took another picture: it does. I've been wondering what to do with this photo for months now. Trouble is, the building is not very photogenic and its history - which is fascinating - is rather long winded and unsuited for my format. I was reluctant to abandon it because I like showing stuff outside of central London. But now I have the perfect solution. 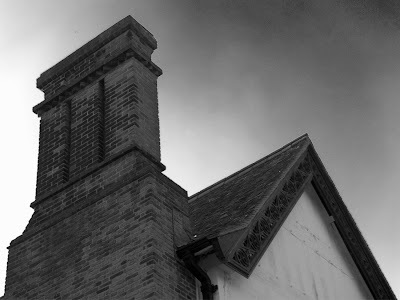 Here is my best, moody, shot of the exterior, and here is a potted history, well reported (thanks, DG!). One more shot from the Russian celebrations, I rather liked this one - check out her tattoo. What was the whole show like? Rather strange, a lot of Russians, but quite fun. This was their idea of a photo opportunity. 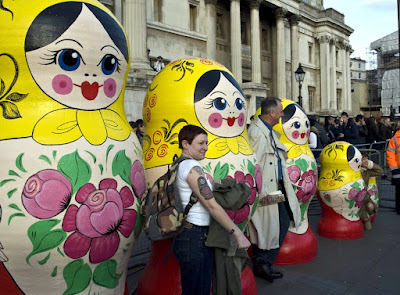 This Sunday saw Trafalgar Square turned over to the Russians, as part of the London's Russian Winter Festival celebrations, marking their New Year. The event was quite fun, with a range of performers, quantities of Russian beer (untried) and Russian food (tried - very good). If it doesn't make sense to you because you are a visitor to the UK, you may have to click here. 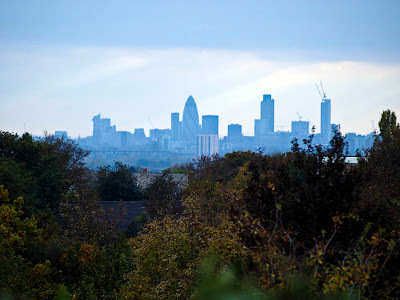 London, like many other cities around the world is at the bottom of a bowl and you get great views from the outskirts. Part of the art of being a Londoner is knowing where to stand. I've shown you two others previously, here is a view from my edge of town. You might find it interesting that most of the nature photos from this site have been shot within a half mile of this point. See where on London Daily Photo Map. 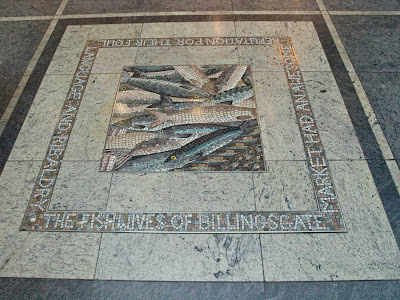 Following on from yesterday's strong woman, here is a mosaic commemorating others - the fishwives of Billingsgate who were famous for their strong language. It is one of a series by Emma Biggs that have been installed in the shopping arcade in Canary Wharf that draw on London's colourful history. Next time you are there shopping, don't forget - look down. I don't know what to think about the hullabaloo from the primaries in the States but the possibility that the next president of the United States could be a woman or a black guy is amzaing - especially when you consider how the Suffragettes and Emmeline Pankhurst had to fight for the vote less than a hundred years ago. Here's another bit of London strangeness. From the plaque: "Before turning to writing full time, Thomas Hardy studied architecture in London... During the 1860s the Midland Railway line was being built over part of the original St. Pancras Churchyard. Blomfield was commissioned by the Bishop of London to supervise the proper exhumation of human remains and dismantling of tombs. He passed this unenviable task to his protegé Thomas Hardy in. c.l865. Hardy would have spent many hours in St. Pancras Churchyard ... overseeing the careful removal of bodies and tombs from the land on which the railway was being built. The headstones around this ashtree would have been placed here about that time. 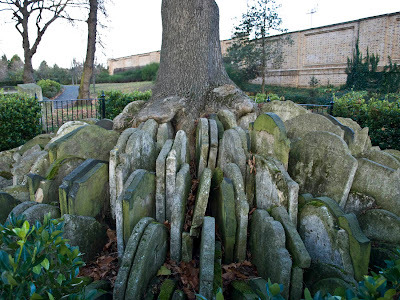 Note how the tree has since grown in amongst the stones." If the feeling comes upon you, you can read all of Thomas Hardy's work here. I may be wrong, but I suspect that most Londoners that know of it think of Chapel Market as one of their "secret" places. Not as famous as Portobello, without the cache of Camden, this has always been one of those places you could find something different - it's got me out of a hole for finding a present on more than one occasion. 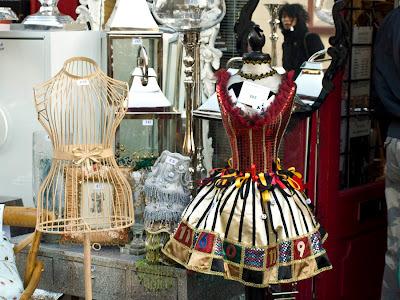 This rather super frock (for £65) or the lampshades (for £9) illustrate this perfectly. 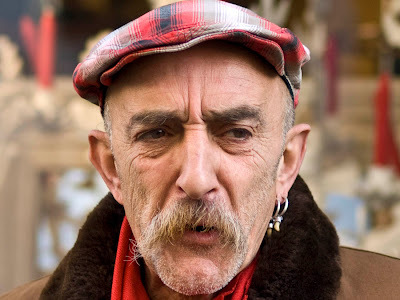 Today, I would like to induct Chris Paraskeva in to the ranks of Ordinary Londoners. Chris is a trader in Camden Passage, Islington and has been for the last eighteen years. He is a real Londoner in that he makes London both his home and his living. In days gone by, he would have sold bric-a-brac, these days, we call it antiques. I'll show you more of the market tomorrow, in the meantime, have you noticed I've added the ability to rate my pictures with a single click? Ah well. Christmas is over for another year, time to pack away all the decorations and contemplate calories once again. 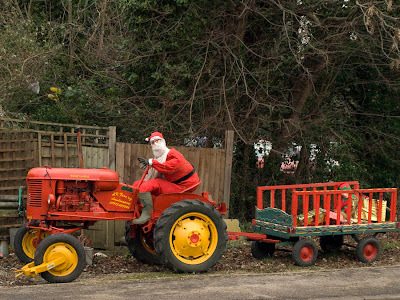 Santa was going to come round to help you, but I'm afraid his tractor got clamped. He should never have let Donner & Blitzen loose on the Babycham. May the coming year bring you and your loved ones all you wish for.